I read an offhand comment somewhere that “schadenfreude” (a word from German that means to take joy in other’s misfortune) had seen a jump in use in the late 1990s, and I wanted to see if that was true. The chart above is the log of the number of times each word turned up in a Google News search for that specific year. This is clearly a small sample and not scientific, but I tried to use words that were similar in that they described a feeling, and I wanted to include positive and negative feelings to control for possible broad changes over time in the sentiment of news writers or the country. 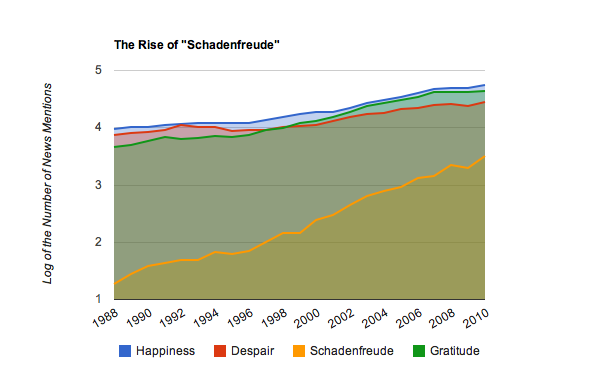 I used a log scale because “schadenfreude” was used so much less often than the other words that I couldn’t see how they tracked together. My pulled-out-of-thin-air theory is that around the dotcom bust, people started using “schadenfreude” because it felt good to see all those overnight-millionaire 20-year-olds get knocked back down to earth, and then more people were aware of the word and it started being used more regularly as appropriate things came up in the news–Martha Stewart’s insider-trading conviction*, Bernie Madoff’s cancer rumor, and so on. *I stand corrected. Martha Stewart was not convicted of insider trading. According to Wikipedia, she was convicted of securities fraud and obstruction of justice. The schadenfreude still applies. This entry was posted in Uncategorized and tagged words usage. Bookmark the permalink. I clearly learned this word when it was before trendy, along with “infra dig,” which sadly has not risen in prominence. In a college German class around 1988, my marvelous teacher told this story (in English) to explain schadenfreude. I sort of assumed it would correspond with the premiere of Avenue Q on Broadway, though that doesn’t seem to match the graph 🙁 Ave Q premiered in 2003. There goes my theory! Unusual and interesting.Can you analyze some other words also? I don’t have time to do any more analysis right now. It would be interesting to see what someone else would come up with though if he or she added many more words or a longer time period. Google “Avenue Q”, Mignon. Might be a correlation there, LOL. What do I think? I think Martha Stewart was never convicted of “insider trading” . Please check your facts. Stewart was indicted by the government on nine counts, including charges of securities fraud and obstruction of justice. After a trial, Stewart was found guilty in March 2004 of conspiracy, obstruction of justice, and making false statements to federal investigators. She was NOT convicted of the “insider trading” charges. I know it from the Boston Legal episode, but that was 2005. Schadenfreude came to my attention through a conversation with Dad where I was whining that there should be a word for…you know, feeling pleasure when someone else screws up. He was pretty sure there was a word and a few clicks on Google later..Wah-la. I’ve named a music night that I run Schadenfreudeless Thursdays–one of my regulars pointed out this site. It’s a bit of a mouthful but it’s great for freeing up the mind to just enjoy music both as a listener and as a player. It’s spilled over into my everyday life as well. Thanks for doing the work on this Mignon! На вашем форме спамить-то можно? Могу ли я раскидать бесмыленные сообщения здесь? Если нет – удалите это сообщение. Если да – я скоро вернусь. With The Weekly type layer selected in the Layers panel, go to the Options Bar and change the Font Family setting to something really thick—I used Rockwell Extra Bold here. — Скоро, скоро,— поспешно и лживо пообещал пациент и посадил всадницу на мустанга. — Это лучшая выпивка в моей жизни, — сказал он, закусив соленым рыжиком. — А другие рюмки у тебя есть? — В палочку – закидалочку.